Yes, the needles you use will make a difference between a frustrating and an exhilarating exercise. Lace knitting involves knitting several stitches together and a good sharp point will accurately pick out the stitches you want to knit. The picture at the left shows the points on Addi’s needles designed specifically for lace. You may want to invest in something like this if you becopme a laceaholic. You will also notice that the needles are metallic. 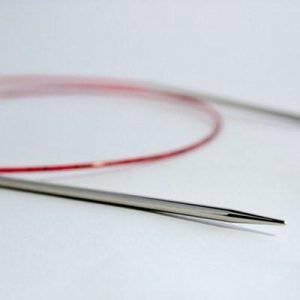 Unlike the needles you use for mittens or socks, which should be sticky, you want lace needles to easily slip through the knitting. 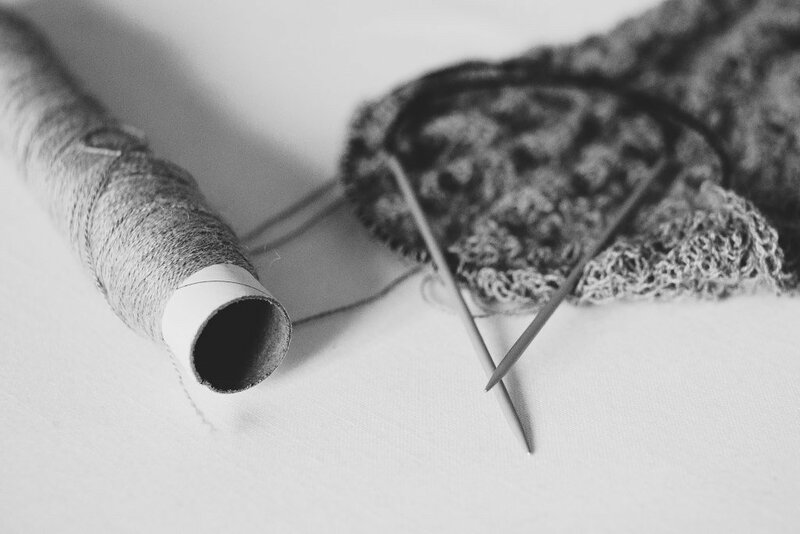 Stitches are less likely to cross each other, causing you to knit them together or in the wrong order. Slippery. Long points. ‘Nough said on that one. Stitch markers in all colours and shapes are your best friends in lace knitting. Use them to separate out each repeat of a pattern in the row. Your counting exercise becomes much simpler as you count the stitches within the repeat. Stitch markers are particularly important near the edges of a piece that will be shaped. When you are dealing with a pattern involving increases and decreases it’s easier to see what is actually happening at the edge when you’ve marked a first full pattern. You can make sure you’ve actually done the decrease (or increase) you’d intended and you can more easily ensure that the increases and decreases remain balanced in knitting that is intended to be for the most part a straight vertical. 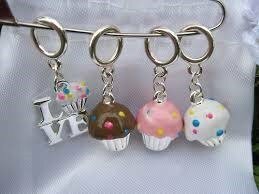 And stitch markers don’t have to be boring. You can make a collection of pretty or unusual ones that give you joy to use. Or you can delight in being frugal, as I am, and use rings intended for cafe curtains or loops of scrap yarn in a contrasting colour. I’d not heard of this one until recently but I think it’s changed my relationship with lace knitting forever. The concept is simple: Using a length of contrasting yarn when you’ve knit a row that completes a set of pattern rows that you know to be correct (because you counted them! ), draw a length of contrasting yarn through all the stitches in the row (skipping the stitch markers). Then you continue knitting. If you need to rip your knitting back, you simply pull out your needle and rip back to the lifeline. Your stitches are held on the line so they won’t drop while you get them back on the needles. You know exactly where you are in the pattern so you can restart, leaving the lifeline in place (just don’t knit it). You can insert several lifelines if needed or move your lifeline up as your work progresses. Wow! Knitting charts make it so much easier to knit lace. The symbols emulate what you are actually going to see in the knitting. For example, a circle in the pattern row usually means you will be creating a hole in the knitting. If you see a diagonal line of circles in the chart, you should see a comparable diagonal line in your knitting when you have completed those rows. 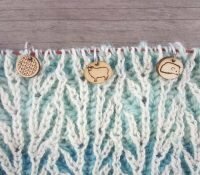 Tin Can Knits have written the definitive how-to post for reading knitting charts You need to carefully consider whether your chart displays all the rows or just the right-side rows. For flat knitting, read the chart from right to left on the RS and from left to right on the WS, when WS rows have been charted. For circular knitting always read the chart from right to left. Amanda Schwabe has pointed out: don’t think a square on the chart as a stitch, think of it as a single instruction to do something. And look at the chart noticing how stitches stack. Where you see vertical lines of stitches, you should see that reflected in the knitting. And before you start, enlarge that pattern so it’s readable and you can mark it up. Then review the symbol legend. Not all designers use the same symbols, although they are becoming far more standardized than in the past. Have errata been produced for the pattern since you purchased it? Before you start knitting, find them and mark up your pattern copy with any corrections that you have found. I always hop into knitting the real piece far too fast and then get lost in attempting to do a complicated pattern. It’s worth it to practice the stitch first using a small sample of a repeat or two or three. This will help you check your tension and teach you the stitch and what to see in the knitting. Periodically put your knitting up on the back of the couch, spread out. Then step back a couple of steps and look at it. Stepping back is the easiest way to see a missed or doubled up row. Even though you pick the yarn at the beginning of the project and block it at the end, these two ideas really go together. Your amazing lace knitting deserves the best yarn possible to show of the wonderful work you’ve done. For first projects pick a smooth high quality yarn that is both good quality and a natural fiber. Why? Acrylic isn’t blockable and lace must be blocked to assume its final shape. “Blocking” means wetting or steaming the garment into its final measurements. Try adding one or more of these to your bag of tricks and I think you will be able to take on more complex lace projects than you thought possible. Have I missed a tip? Send them along and I’ll happily add them to this post. Happy lace knitting!